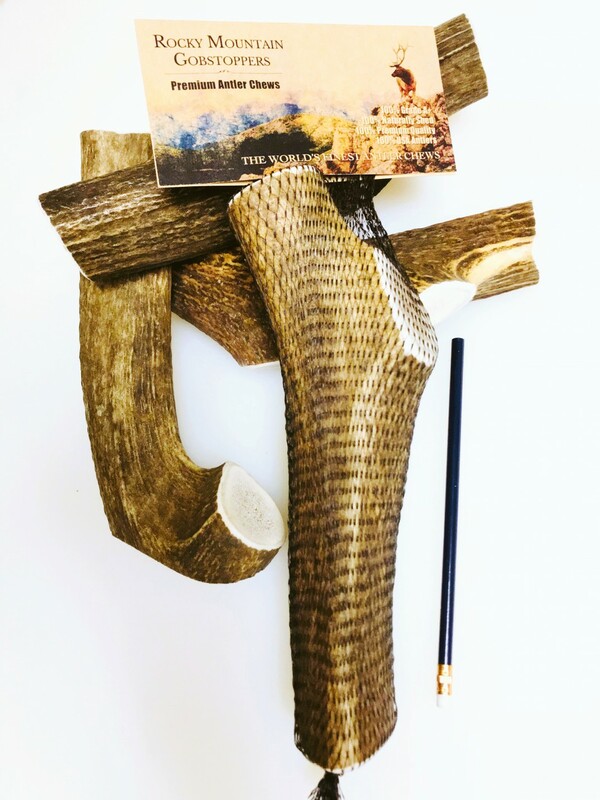 Our GIANT-WHOLE Rocky Mountain Gobstoppers are cut from Premium Quality, Grade-A+ Naturally Shed Elk antlers from 4 western US states. 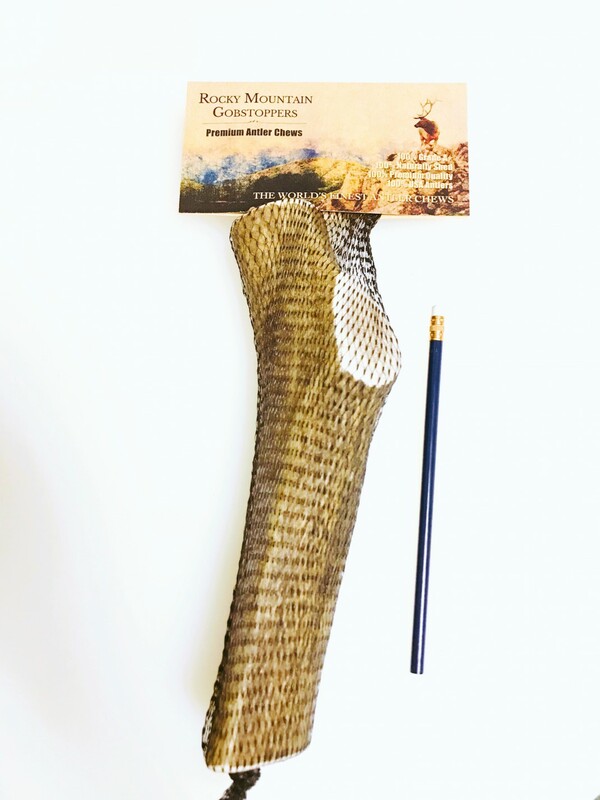 The typical GIANT WHOLE Rocky Mountain Gobstopper Elk Antler Chew is 10-12" long and typically weighs a pound or more, the perfect sized Elk Antler Chew for Large Dogs 75 pounds and up. The typical GIANT-WHOLE Rocky Mountian Gobbstopper Chew weighs very close to a pound or more! The secret is out! 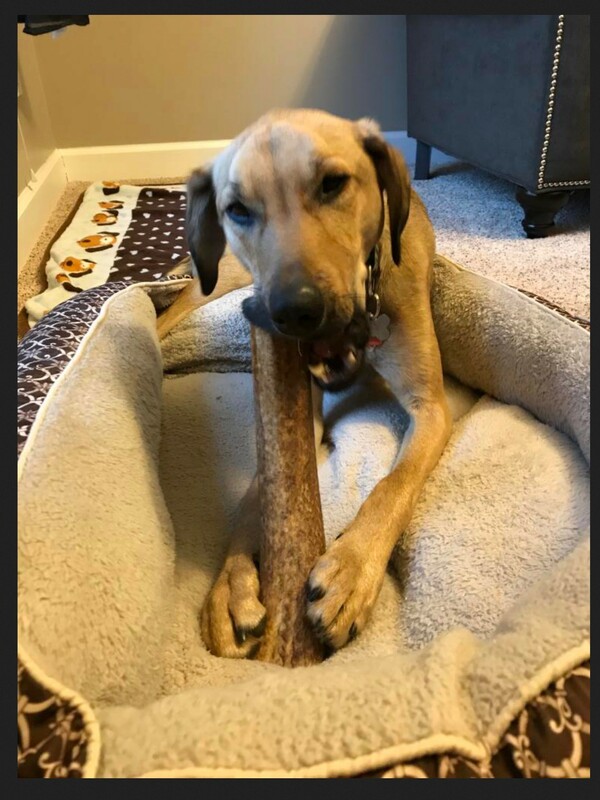 Dogs find fresh Elk Antler Chews irresistible, so let your Dog be a Dog, unlock his natural instincts the healthy way and order some Premium Elk Antler Dog Chews today! 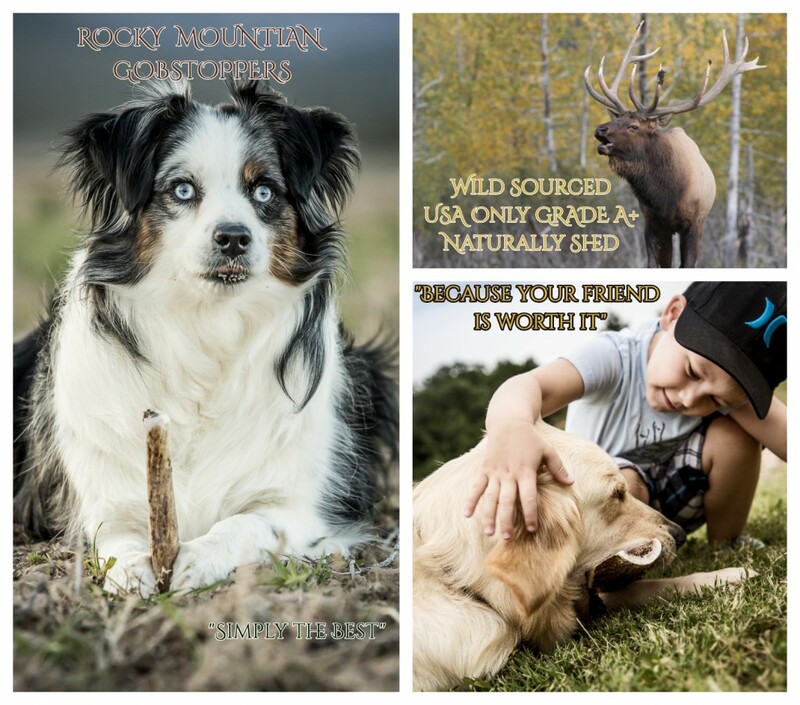 Rocky Mountian Gobstoppers are the worlds finest Antler Chews, always made from fresh Grade-A+ 100% all natural, shed USA only antlers! This is the best palce to buy odor-free and very long lasting. These antler dog chews come right out of nature each spring shortly after the elk drops them, so they are completely unprocessed! "I ordered from this company based on positive reviews, couldn’t believe this giant elk antler really lived up to its name! I’m used to getting the largest deer antlers at various stores, which aren’t big at all. Our pup Max loves antlers and they don’t last long but this one surely will. After receiving this giant I realize I could have ordered the size smaller for Max. But honestly I didn’t think it would be this huge, that’s a good thing! Couldn’t believe I ordered this and received it 2 days later! Super fast! You won’t be disappointed if you order from this company!" I have a 3yo bulldog who LOVES antlers, normally goes through them so quick. But i think the elk antlers will have him occupied for awhile. The quality is great, the size is great & my dog loves them. Definitely will be coming back for some more! Also shipping was fast! These are the best elk antlers I have found. 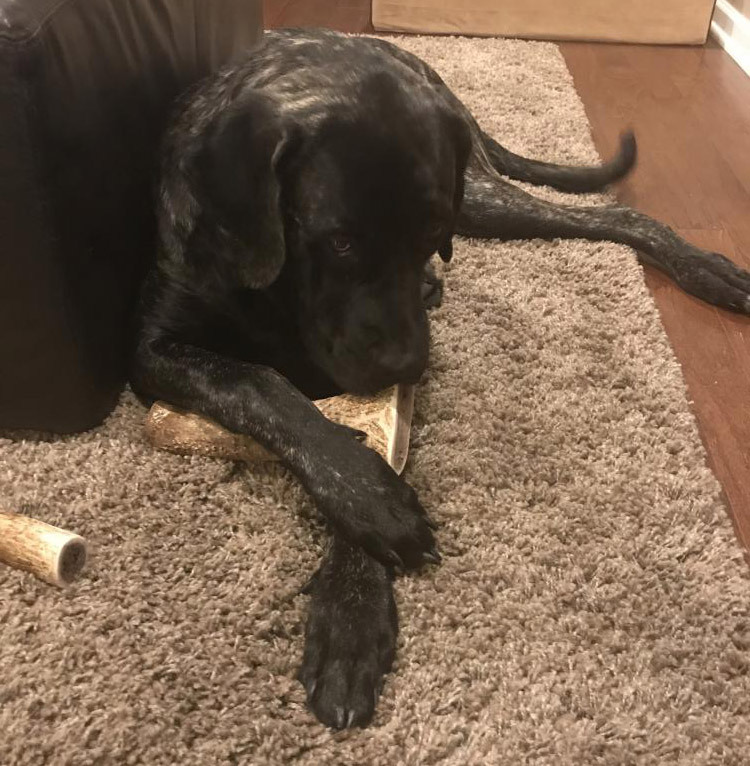 We have a 120 Cane Corso and he absolutely loves these antlers. One antler will last him about 3 months. Buy them, you won’t be disappointed! We have two great danes who can go through most chews in hurry. These elk antlers hold up. Thanks again for the quick shipment. 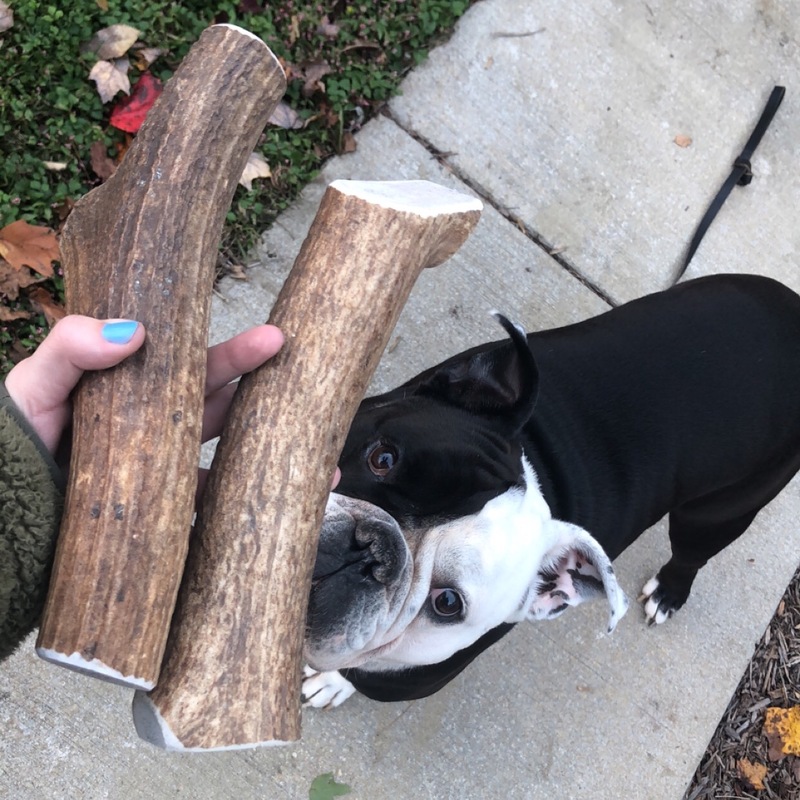 I got the XL Elk Antler and it is even bigger than I imagined! My 140 lb Great Dane LOVES this thing. AND we received it in two days. Will definitely be ordering again!! Our six month old Mastiff puppy loves these antlers! I definitely recommend these for the big chewers in your home! I have two Great Danes and they love these. Finally something they can chew to keep them busy and not destroy! The XL size is perfect for them! 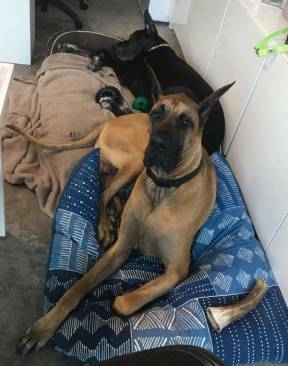 My boys are 190 lbs and 160 lbs each. We need big strong toys! I have a husky and a Belgian Shepherd husky mix that are heavy chewers. Before finding this site I was spending $120+ a month on elk antlers at a local shop. I took a chance and ordered them from this site and to my pleasant surprise I received some great Antlers! My boys are thrilled as am I! I will be ordering again! I purchased an antler for my 1yr old 65lbs golden who is a heavy chewer, and when I received the antler I was extremely pleased with the size of it! I have ordered from other companies this year and have been extremely disappointed with the size of the antler we received for the price - they are half the size. Extremely satisfied and will definitely be ordering from here again!